This is a study guide for the book All the Pretty Horses written by Cormac McCarthy. 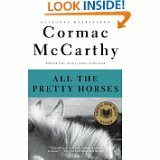 All the Pretty Horses is a novel by U.S. author Cormac McCarthy published in 1992. Its romanticism (in contrast to the bleakness of McCarthy's earlier work) brought the writer much public attention. The novel was a bestseller and won the U.S. National Book Award as well as the National Book Critics Circle Award. Please click on the literary analysis category you wish to be displayed.